Part of our role in the artistic community is to make certain that artists have the tools they need. Through the generosity of individuals and organizations such as the D'Addario Foundation, Strings by Mail, and Clancy's Guitar School. we are able to provide instruments and accessories to our program participants, their students and their communities. 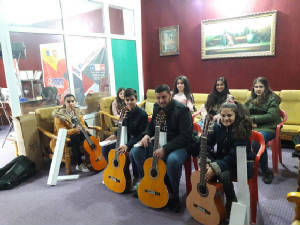 Students at our Remember the River guitar program in Kurdistan wait for classes with their new instruments. The program is taught and managed by Ramy Gorbil, who has been one of our treasured program participants since 2013. 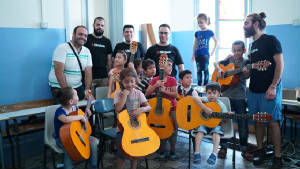 Children whose families were forced to flee from Syria are excited about their new guitars! Jusoor provides support for the program, while Remember the River provides the instruments and guitars. 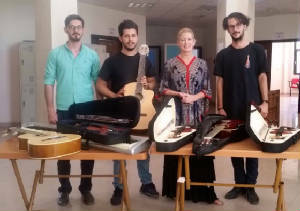 Our program participants from Syria, the Orontes Guitar Quartet, provide the expertise and the inspiration. We were honored to have the opportunity to send instruments to Mosul,Iraq. Most of the musical instruments in the ancient city were destroyed under the three years of occupation by ISIS. Yet again, beauty and creativity win!